Instantly generate a background for a fantasy character. Breathe life into your role-playing or fantasy character. With 40 tables and hundreds of options, there are millions of possible combinations, making sure that no two character's backgrounds are exactly alike. Great for role-players or authors. 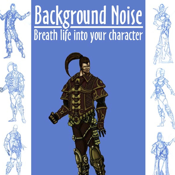 So add some Background Noise to your character, they'll thank you for it.